Studying biological samples with both fluorescent microscopy and electron microscopy to gain high detailed colour images can be a challenging and time consuming job. 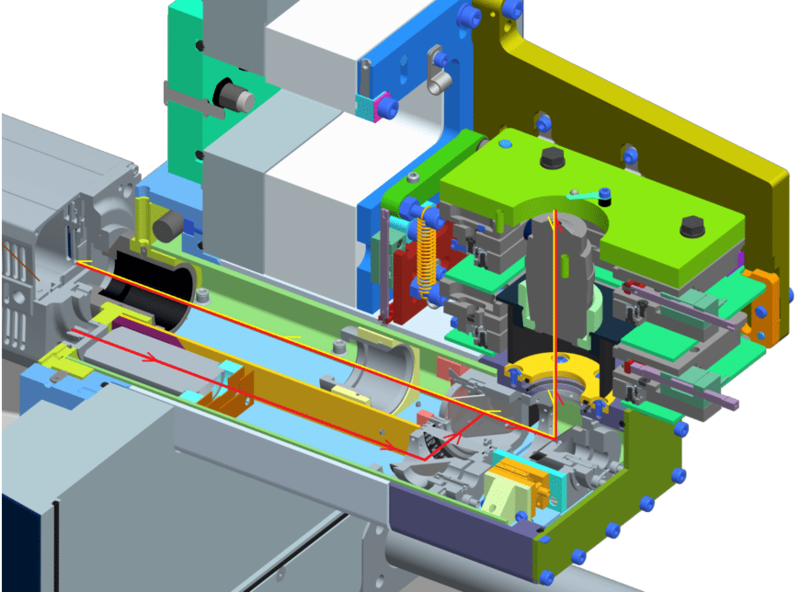 Delmic, a company originating from the Charged Particle Optics group of the TU Delft has found a perfect solution to combine these two actions into one device: The SECOM Platform. This platform ensures perfect image correlation with ease and saves lots of valuable time. Hittech Multin has designed the complete SECOM platform and recently designed the complete SECOM 2.0 platform with new and improved features. Very compact design space: 200 x 200 x 200 mm. Travel path of the optical beam. The system can be used for both bright field and fluorescent microscopy. 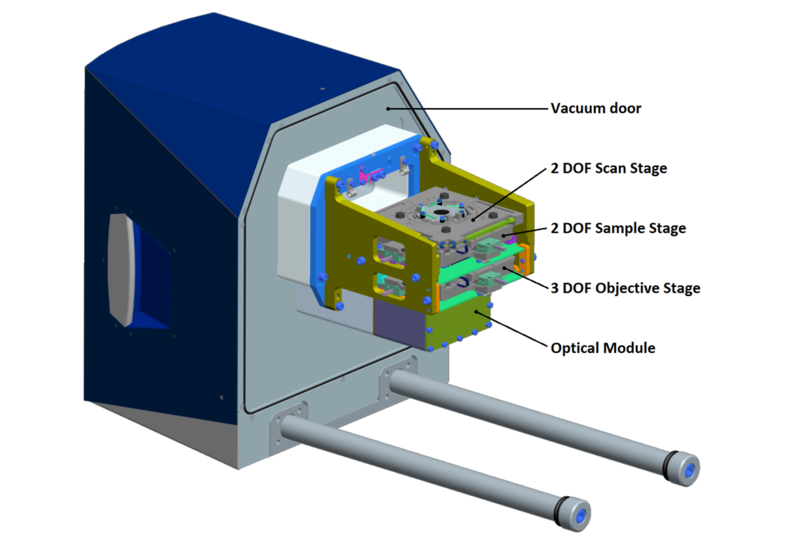 Most of the optical elements are placed on the atmospheric side of the vacuum door to reduce costs and optimize design space. The high speed scan stage: With its lowest eigenfrequency above 1 kHz, this scan stage is able to scan 200.000 pixels/second. 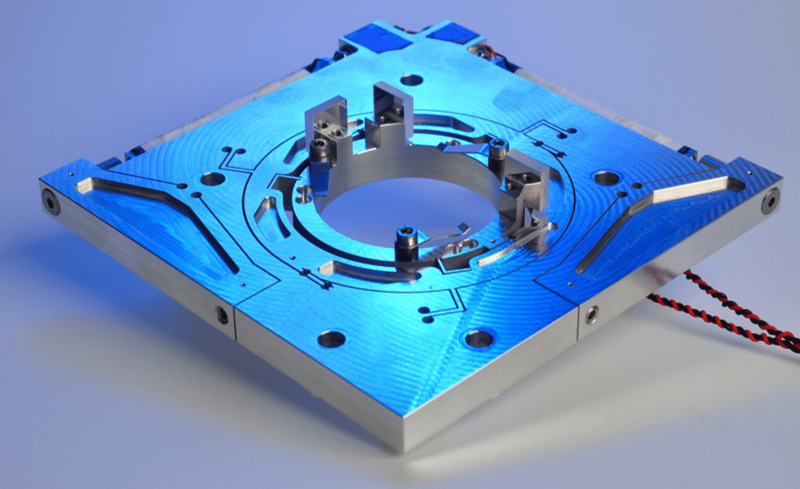 Mirrors were placed on the inner ring to use dual pass heterodyne laser interferometers for performance verification tests. No positional errors due to excitation of lower eigenfrequencies of the system. Bandwidth optimization of the scan stage itself, allowing even higher scan rates, since the scan stage is now isolated from the rest of the system.